‘Native’ is about to be published through Boekscout Publishing! No, it didn’t take me eight years to write but it’s been on the backburner for a few years because back in 2011 I couldn’t find a publisher who focused on debutants. I didn’t make things easy for myself by writing a sci-fi story in English, which isn’t my native language. Because I really like to read sci-fi in English myself; there are certain words and expressions which translate poorly into Dutch. Besides that, it forced me to think about what word I wanted to use at any specific time. Fortunately, at the end of 2017, I came across Boekscout’s website and they saw enough potential in my wild story to make it into a book and publish it. English works were (and are) no problem for them and I am very grateful for all the support I received. A work of epic proportions, in the style of Tolstoj, with professional terms requiring immense background knowledge… that’s not this book..
A chilling deep-space horror which could teach Stephen King a thing or two… this book isn’t that either. A lot of bad (and good!) 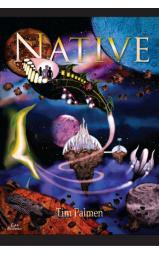 jokes about a band of space pirates; a planet which has been kept off the maps, deadly Lawyers, lethal commercials and a killer Library: Native has it all (and more). The publication date is 22 january 2019 and for whoever made it this far here’s a sneak peak of what’s to come. More to follow next week! Hello David, Thank you! That will be possible either through the webshop of Boekscout.nl as soon as the book gets released (which will be approximately around the 22nd of February) or I can send them to you.